As everyone knows, in Jonathan Demme's masterpiece, a rookie FBI agent consults a captured serial killer to catch an even nastier one, right? Well, if you don't know, log off and go rent it. When I initially reviewed this film, I wondered aloud if it was Horror or not. Now, with a few hundred more flicks under my belt, I feel there's no question about it. 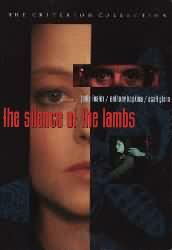 I committed the now-shameful sin of calling The Silence of the Lambs "a psychological thriller," the term people who hate horror films use to justify seeing them. It's a hypocrite's word, and I've publicly derided those cowards who rely on it. Well, my foot is in my mouth, but let's forget about that and move on. Jodie Foster delivers a powerful, living performance that would bring me to tears if I was capable of human feeling. She's multi-faceted, intelligent, great to watch, this was the film that made me a Jodie Foster fan. Even so, it's clearly Anthony Hopkins's movie. Hopkins's performance as Hannibal Lecter has been scrutinized and praised a thousand times, so there's nothing I can add to what's been said. His Hannibal Lecter is so riveting and original, that he will always be associated with the role, even though it came twenty years into his career. He's a fascinating character, menacing yet attractive, brilliant yet savage, intimidating yet likable (whoops, I guess I tried to add something). Buffalo Bill, played by Ted Levine, is one of the most disturbing and frightening characters I've ever seen. Just the thought of "It rubs the lotion on its skin or else it gets the hose again" makes me cringe. And if you look closely, you can see horror movie filmmakers Roger Corman and George A. Romero (plus singer Chris Isaak) in bit parts. The dialogue (very faithful to the Thomas Harris novel) is so perfect even the non-schizophrenic find themselves reciting it. It is bleak and graphic, and I recall that when it was released, I had to lie to my mother about going to see it (in hindsight, I didn't HAVE to lie, I just chose to). But it's also sort of an art film. In fact, this is the most honored horror film in history (if they'll admit that it's a horror film), winning all five main Oscar statues in 1992. Cool. Best Scare: The final confrontation with "Buffalo Bill." VERY tense. I'd Recommend It To: Any movie fan able to take it. Hannibal Lecter is simply the most convincingly amoral person I've ever seen on the screen. He is the truly frightening part of this movie. Buffalo Bill is merely a convenience to introduce us to the doctor. Anthony Hopkins and Jodie Foster deliver intensity that is simply not present in most horror shows. While I doubt that most people would list this as a horror film (if simply because the Academy would never consider a "horror" film worthy of 7 Oscar nominations), I think this is horror in the purest sense. When there is something out there that would willingly kill us all and yet is the most intelligent person we've ever met, it is time to be afraid.